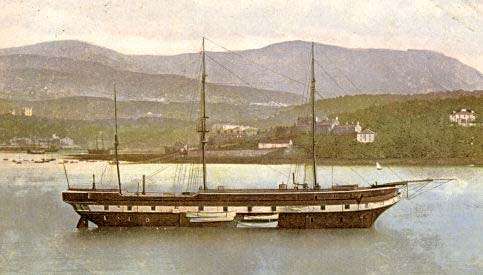 Another training ship that was based on the Menai Straits was the HMS Clio, a 22 gun corvette who was the sister ship of the famous HMS Challenger. She was lent to the North Wales Society between 1877 and 1920 in order to train youths for a life at sea. Boys were sent to her to be prepared for a life at sea and to be introduced to discipline. Many locals considered the ship to be a prison boat or a reformatory for young offenders. Although this wasn’t strictly true, many of the youths sent onto the ship were ‘difficult’ children, who were considered to need firm control and discipline to save them from a life of crime. Many were forced to go against their will and none were allowed to leave the ship. Onboard life was not pleasant. Beatings and other severe punishments were handed out to those breaking the rules, but beatings were often carried out to provide entertainment for senior crew members. These acts of bullying were so severe that students who had been beaten had to sleep on their front for days afterwards. This was not helped by the fact that older students would bully younger students by rubbing salt water into cuts sustained from beatings. Life on the HMS Clio was infamous at the time and left its legacy with the locals. For years after the demise of the Clio, mothers would still threaten to send their children to the ship to be punished.